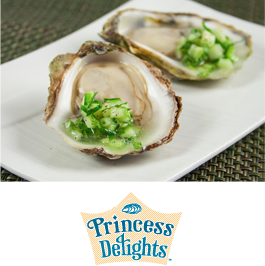 Oysters are not only delicious, but they're also one of the most nutritionally balanced of foods, containing protein, carbohydrates and lipids. 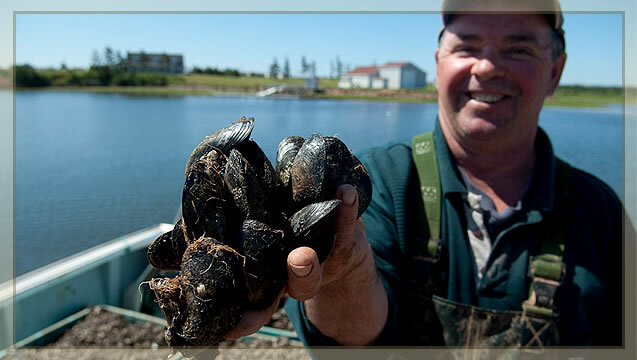 Shuck and serve on the half shell or add them to a chowder, and taste how good oysters can be for you! Place butter, creamed corn, chipotle pepper puree, basil & lime zest in a mixing bowl; beat until well combined. Place a large piece of plastic wrap onto the counter, spoon the butter mixture onto the bottom section of the plastic wrap. Roll the butter up into the plastic wrap creating a log. Place butter into the refrigerator and chill until firm. 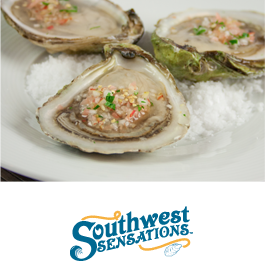 Heat a grill to medium-high heat; place oysters onto the grill and cook until oysters pop open. Carefully take the oysters off the grill, remove top shell and place oysters into each bottom shell. 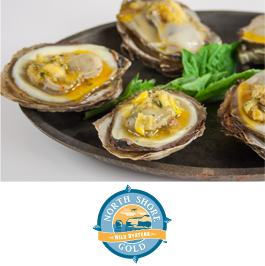 Top oysters with a slice of butter and place onto plates or a serving platter. Serve hot. Combine mango and orange juice in a blender and puree until smooth. Fold in chives, tarragon & peppercorns; chill until ready to serve. Place 1 ounce of the mango sauce into small glasses. 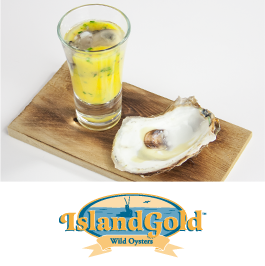 Top each glass with an oyster in the shell. To eat: drop the oyster into the mango sauce and enjoy. * 1 fresh mango, peeled and diced can be substituted for the frozen mango. Place flour, 2 eggs (beaten) and panko crumbs into 3 separate bowls; coat each oyster in flour, dip into egg and then coat in panko crumbs, set onto a plate. Bring a large pot of water to a boil; add vinegar. Toast English muffins and place onto four plates. Melt 2 tbsp butter in a medium sauté pan; add baby kale, season with salt & pepper and cook stirring occasionally until wilted (2-3 minutes). Place wilted kale onto each English muffin. Gently crack the remaining 4 eggs into the water and poach to desired doneness. 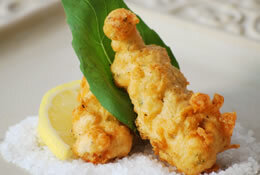 Using the same pan as the kale; heat the remaining 2 tbsp of butter and fry oysters until breading is golden and crispy. Remove oysters from the pan and place onto kale. 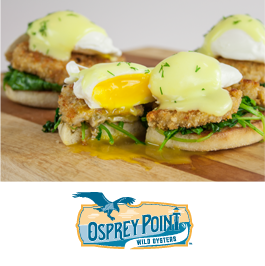 Remove eggs from poaching water, draining off excess water and place one egg on each English muffin. Top with hollandaise sauce & dill and serve hot with your favourite side dish. Remove oysters from shell and discard liquid and shells; set oysters aside. Heat a medium pot over medium-high heat; add butter. Add leeks and yellow onion; reduce heat and cook stirring occasionally until softened. Add garlic and cook until fragrant; add cream and continue cooking until reduced by half. Add oysters & season with salt & pepper. Gently simmer until oysters become opaque and are cooked through. Top each slice of baguette with one oyster and some of the leek & onion mixture. Garnish with Gouda cheese and broil just until cheese is melted. Serve hot. Heat a medium sauté pan over medium-high heat; add oil. Add chorizo sausage and cook until it starts to caramelize. Add in garlic and cherry tomatoes; cook just until garlic is fragrant and tomatoes have softened. Fold in basil and season with salt & pepper. 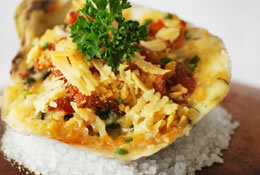 Top each oyster with some of the chorizo mixture and Asiago cheese; bake until bubbly 8-10 minutes. Serve hot. Place oysters on a baking sheet. Bake in oven until the shells open, about 5-7 minutes. Carefully remove oysters from shell; discard liquid and shells. 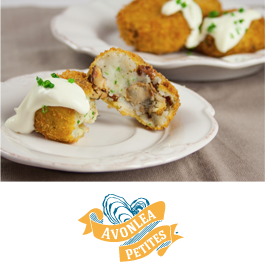 Combine oysters, mashed potatoes, double smoked bacon and chives. Season mixture with salt & pepper; divide into 8 portions and form into cakes. Season flour with salt & pepper; dredge each oyster cake in the flour. Dip into eggs and let excess drip off before coating in panko crumbs. Sear both sides of the oyster cakes until golden and place onto a baking sheet. Place in oven and cook until heated through for 10-15 minutes. Serve hot with a side of crème fraiche or sour cream. Place oysters onto a plate or serving tray. Combine cucumber, lime zest & juice, mint and honey. Season with salt & pepper and stir well to combine. Spoon some of the salsa onto each oyster. Serve cold. Place beets, water, sugar and salt into a medium pot; heat over medium-high heat and bring to a boil. Reduce heat and cook for 15-20 minutes or until softened; remove from heat and allow to cool. Add lemon juice & zest to the beet mixture and puree until smooth; strain through a fine mesh strainer. Place beet liquid into a baking dish and put into a freezer. As the liquid begins to freeze occasionally stir it with a fork to create ice crystals. Once the mixture is frozen it is ready to use. Place oysters onto a plate or serving platter. Top with a dollop of crème fresh. 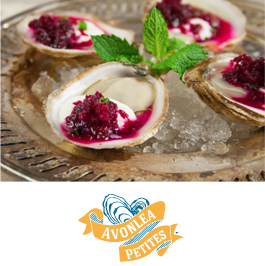 Scrape some of the beet granita onto each oyster and garnish with mint. Serve cold. Shuck all oysters. Strain and reserve the Oyster Liquor. Place the empty shell bottoms on a sheet pan that is lined with crumpled foil in a way that the foil will provide support for the shell and juice will not run out of the shell. Sauté the shallots and garlic in olive oil over medium heat until they are translucent. Deglaze with white wine. Add the Oyster Liquor and the spinach. Steam the spinach for 1 minute. Place some cooked spinach in the bottom of each oyster shell and place one oyster on top of the spinach in each oyster shell. Reduce the juice that is left from steaming the spinach by half and then add the cream and continue to reduce until it starts to thicken. Add the Parmesan cheese and the fresh herbs. Season the sauce with salt and fresh cracked black pepper. 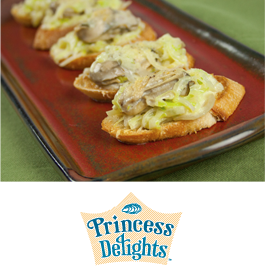 Top each oyster with approximately 1 tbsp of the sauce, a few bacon bits, and 1 tsp of bread crumbs. 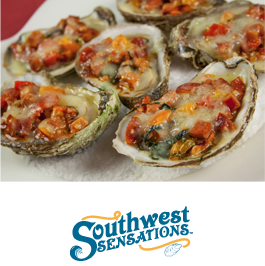 Place the sheet pan of oysters in the oven for approximately 4-6 minutes or until the sauce starts to turn golden brown. Shuck all of the oysters and then strain and reserve the Oyster Liquor. Place the empty shell bottoms on a sheet pan that is lined with crumpled foil in a way that the foil will provide support for the shell and the juice will not run out of the shell. Sauté the shallots and garlic in olive oil over medium heat in a sauté pan until they are translucent. Deglaze with white wine. Add the Oyster Liquor and the spinach. Steam the spinach for one minute. Place some cooked spinach in the bottom of each oyster shell and place one oyster on top of the spinach in each oyster shell. Place ½ tbsp of the juice that is left from steaming the spinach into each shell. 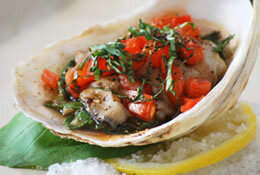 Top each oyster with some chopped tomato, some fresh basil and a drizzle of balsamic vinegar. Season each oyster with salt and fresh cracked black pepper. Place the sheet pan of oysters in a preheated oven at 375 F for approximately 4-6 minutes. Combine eggs, flour and water and whisk until you have a smooth batter. If it seems too thick, simply add a little more water to thin. Add herbs, Tabasco, garlic, salt, and pepper and stir. Lightly dust the oyster with all purpose flour. Carefully heat a pot of frying oil to 350 F and place the oysters in 6 - 8 at a time and cook until they are golden and crispy (2 - 3 minutes).